Arriving into Changi airport my phone buzzes with an incoming message while in the customs queue. “No Signboard 414 Geylang road, Geylang”. Sender was unknown. Certainly a cryptic welcome message from Singapore tourism if they are behind it. I had arrived in Singapore after attending a friend’s wedding in Sydney the night before. I was to meet friends Dave and Lesley from London and my brother in-law Bud. We were looking forward to a few days of rest and relaxation to kick back, catch up and ultimately scout out Singapore. Still, I was curious about this message that had arrived. Sporting a post wedding hangover and a bit of jetlag my mental faculties were not at their prime. So I turned to Google to act on behalf of my brain. ‘No Signboard 414 Geylang road, Geylang’ was copied, then pasted into the awaiting search field. Results returned both listings for a seafood restaurant and the centre of Singapore’s red light district. Could it be that the mainly conservative Singapore tourism is promoting promiscuity? All of a sudden my phone buzzes again with a second message “The white pepper crab is better than the chilli have fun!”. I then recalled having a conversation at the before mentioned wedding. A good friend was telling me to avoid the touristy Boat Key restaurants of Singapore in favour of a more traditional, and reputably better, seafood restaurant in the outskirts of Singapore . Unless of course he is playing some practical joke and sending me to a house of ill repute. Sometimes a cryptic message can send you on an adventure! We decided on a visit to No Signboard on Geylang Rd for the second night. It was a short and cheap taxi ride from our very pleasant accommodations at the Mandarin Oriental. While the Singapore subway (MRT) is one of the most efficient in the world, the door to door service in Singapore’s clean, air conditioned cabs rarely exceed $10 on the meter so hard to argue with, particularly for a group of four. Arriving into Geylang Road the hustle and bustle of cars, bikes, wagons, market and hawker food stalls was in contrast to the more modern, clinical expansive downtown and harbour areas with their more well-known waterside restaurants. We are soon dropped off by our taxi at the requested 414 Geylang Rd. Ironically, the No Signboard restaurant was clearly marked with a prominent signboard. The name ‘No Signboard’ originates from the 70’s when founders Madam Ong Kim Hoi and husband Choo Ah Kaw pioneered the selling of seafood at the nearby Mattar Rd Hawker Centre. This together with Madam Ong’s unique white pepper crab recipe created a niche from where demand for her delicious crab spread by simple word of mouth. Patrons directed their friends towards ‘the stall with no signboard’. No Signboard now has three more modern restaurants scattered around Singapore. The restaurant on Geyland Rd is arguably closer to the original hawker style eatery from which it was founded. Plastic chairs and fold away tables on an open-air patio is the extent of the welcome decor. Hardly a secret from the locals though as the place was near full when we were ushered to one of the twenty tables by our waitress. All the staff were wired up with headsets and microphones. A quirk that we decide is some sort of crab central command centre. We envisioned Madam Ong and husband Ah Kow sat back in white suits on high back velvet chairs, stroking a cat and at the master control panel. Strategically directing their restaurants and waiter agents as they dispense seafood across Singapore. Back to reality though, we perused the menu in what was really a charade as we were set on the house speciality, the white pepper crab. While Singapore chilli crab is the equivalent of the national dish, white pepper crab is Madam Ong’s original recipe. We added fried rice and spicy Asian greens to go with what we decide is a suitable sized crab for the task. Next up the confronting bit, we are asked to choose our crab. Apparently this is not an optional thing. Our gestures to wave off this requirement are not accepted. So we relent and I along with Lesley head over to reluctantly choose our meal. It’s one of those occasions when if it wasn’t us it would be someone else so an attempt at saving our quarry would be futile. So we are shown rather than choose our crab and he certainly is a big one. Back at the table we have a small pang of guilt for the crab we have now named ‘Hercules’. He’s more than just a meal for us now, but we are also hungry, so we choose to drown our sorrows on a local Tiger beer. Soon enough Hercules is being brought to the table. The grey colour he had in the tank is now rich red. Normally, I’ll be honest, I feel eating crab is hardly worth the effort. Having to extricate small bits of flesh among claws using slippery metal tools while in the grips of hangryiness is ultimately frustrating. Here however large portions of beautifully seasoned crab meat were prepared under the cover of the main shell. A small crack of the crab pliers revealed even more easily accessible flesh. The decision to stray from the standard chilli sauce in favour of the white pepper seasoning was the right choice indeed. The white pepper seasoning was a lot better than being over smeared with the powerful chilli sauce. The rice and greens turned out to be a good accompaniment also. 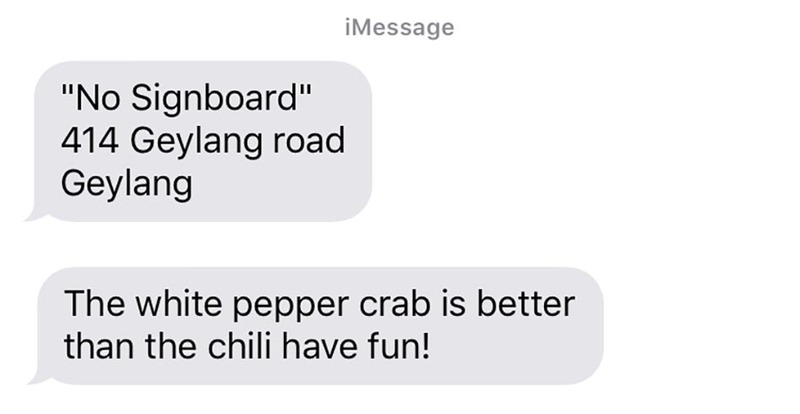 I was fortunate to return to No Signboard on Geyland Rd in late 2014 to once again enjoy the white pepper crab. Sadly, Madam Ong Kim Hoi had since passed away. The experience however was equal to my first. The No Signboard franchise is still very much a family run business. Madam Ong’s legacy will be around for many years to come for locals and travellers alike to enjoy an excellent authentic seafood meal in Singapore.